Registrations are now open for the South-east Australia Aboriginal Fire Forum. 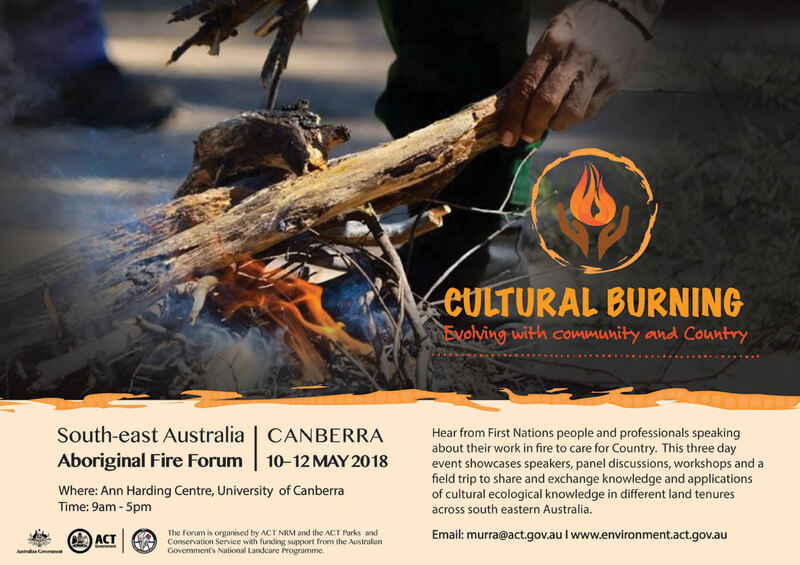 The Forum, titled Cultural Burning: Evolving with community and Country, will give participants the opportunity to network, learn, and establish collaborations with others committed to cultural burning and caring for Country. The Forum will be held at the Ann Harding Centre, University of Canberra, Bruce, ACT from Thursday 10 to Friday 11 May 2018 and will be followed by a field day on Saturday 12 May 2018. There are a number of ways you can register as explained on the website but the simplest way is online via Eventbrite. Registrations to Aboriginal and Torres Strait Islander community members are free but spaces are limited and are aimed at those who are available to attend the whole three days. To help celebrate the Forum there will be a dinner hosted by Steven Oliver and entertainment by Johnny B Bad and The Good Seeds at Pialligo Estate on the evening of 10 May 2018.